First edition of the 38th president of the United States’ autobiography. Octavo, original cloth, illustrated. 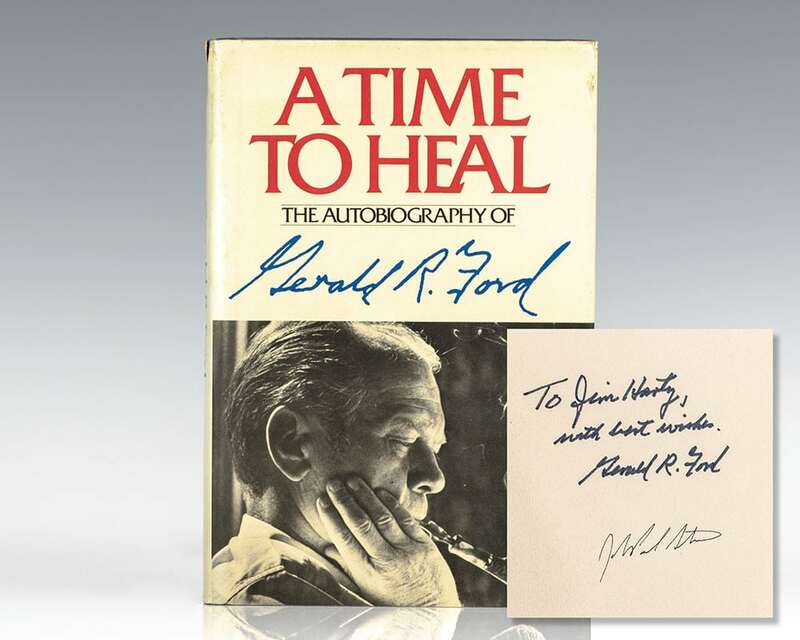 Presentation copy, inscribed by Gerald Ford on the front free endpaper page and additionally signed by John Paul Stevens. In 1970, President Richard Nixon appointed Stevens to the Court of Appeals for the Seventh Circuit. Five years later, President Gerald Ford successfully nominated Stevens to the Supreme Court to fill the vacancy caused by the retirement of Justice William O. Douglas. Fine in a near fine price-clipped dust jacket. Jacket design by Lawrence Ratzkin. Desirable signed by both Ford and Stevens. This memoir was the most extensive commentary Gerald Ford ever provided regarding American politics. He granted several interviews over the years, but they were usually short and not very introspective. Ford was perfectly willing to retire from the public eye and concentrate on serving on the boards of directors of various businesses. Unlike most ex-presidents who work hard to achieve elder statesman status to either rehabilitate or firm up their place in history, Ford was satisfied with what he'd done in his years of public service. While he was never called an "amiable dunce" as Clark Clifford once called Ronald Reagan, Ford never developed a reputation as a brilliant strategist nor was he gifted with a knack for policy development. However, in reading his memoirs, one finds a man very comfortable with himself and his decisions. Public Papers of the Presidents of the United States Gerald Ford 1975. Washington, D.C: United States Government Printing Office, 1977. First edition of this collection of public messages, speeches, and statements of President Ford. Thick octavo, original cloth. Signed by Gerald Ford on the front free endpaper. In very good condition, bookplate, deaccessioned from a library.